URGENT: Construction crews are closing in on both sides of Camp White Pine. 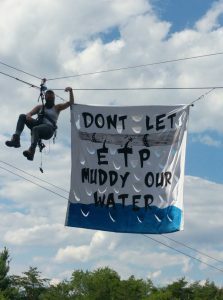 For nearly two years, Elise and Ellen Gerhart, along with many allies, have been holding tree sits on their property to defend their land from Energy Transfer Partners’ Mariner East II Pipeline. The project would destroy their family’s land in order to export highly volatile fracking waste to Europe for plastics manufacturing. Already during construction, Mariner East II has caused dozens of spills, contaminating water supplies and in some cases permanently damaging residential wells. As the Gerharts prepare to take a bold stand to protect their land, they need our support.